An Investigation into the upcoming Bedroom Tax in the Birmingham area. Councillor John Cotton from Birmingham City Council kindly gave an interview giving his opinion on the Bedroom Tax. He repeatedly referred to the policy as a “blunt instrument” used by the government to “chase headlines” which he admitted it has, only they may not be the headlines they desired. Below is the video. After the interview John gave a final note, emphasizing the point that there are still a lot of people out there that do not know about or understand the Bedroom Tax and that awareness is key, finishing on that anyone wishing to know more about the Bedroom Tax can visit the councils dedicated web page. Ladywood to be the most affected area of Birmingham? 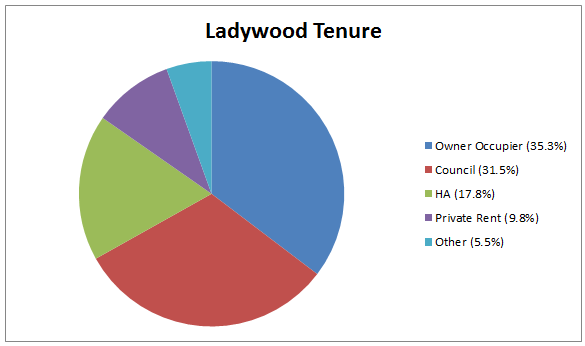 Almost half of Ladywood residents will potentially be affected by the Bedroom Tax. Around 49% are either council tenants or live in a Housing Association property. Statistics released by Birmingham City Council, show that over 31% of Ladywood residents live in Local Authority Housing, as well as almost 18% living in a property provided by the Housing Association. The tenants who are deemed to have a spare bedroom will see the effects of April 2013’s new policy. 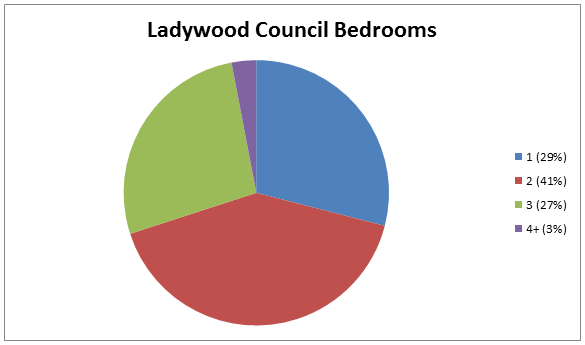 With only 29% of Ladywood council tenants having just one bedroom, a potential of 71% may be affected by the Bedroom Tax. If rooms are not filled to the requirements of the policy, residents will see their benefits cut significantly. Negative effects have already began to occur in the Ladywood area. One resident’s story can be seen here. Erdington, Northfield and Hodge Hill are other areas of Birmingham which have fairly high Local Authority and Housing Association rates. 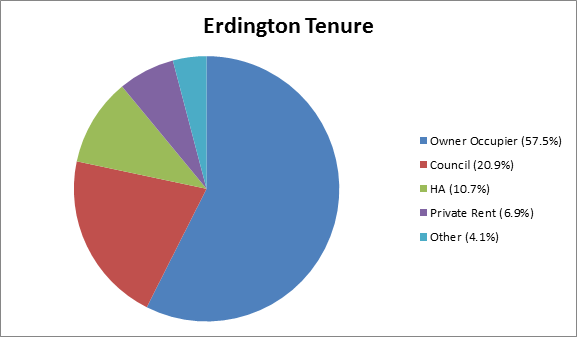 Around a third of Erdington’s residents may be affected by the Bedroom Tax, as almost 21% are council tenants and a further 10.7% live in a HA property. 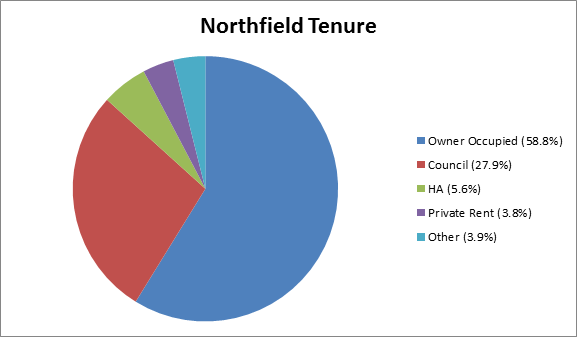 Northfield shows slightly higher results. 33.5% of its population are likely to be affected, with nearly 28% in council housing and over 5% depending on the HA. 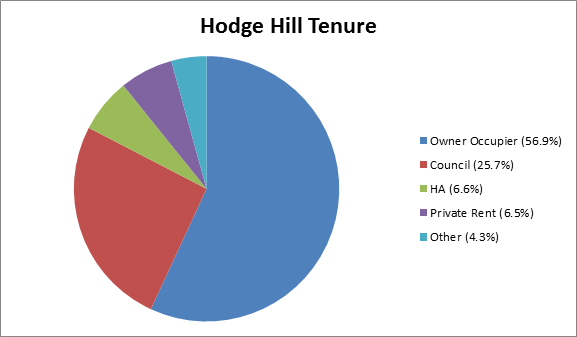 Hodge Hill indicates similar statistics, with over 32% potentially being affected by Bedroom Tax. Over a quarter live in Local Authority Housing and nearly 7% live in a property provided by the HA. Click on the image to view the full map. This map shows where these highly affected areas are in Birmingham. More than 20% of council tenants in the UK have a full time job, suggesting that full time workers are likely to be significantly affected by the Bedroom Tax. Around 265,000 people live in Local Authority Housing nationally. This is a large proportion of the estimated 660,000 people to be affected by the Bedroom Tax. Statistics from 2011/2012 indicate that full time workers are potentially one of the most affected demographics. This sparks debate on whether hard working people and tax payers deserve to have their benefits cut as of April 2013. To many, the Bedroom Tax highly affecting those in full time work is likely to be seen as unfair and unjustified. Data released by the Government also shows that job seekers will potentially be the most affected by the Bedroom Tax, as over 22% of council tenants are looking for work. Around 1 in 5 of those living in Local Authority Housing are unemployed. This demographic is sure to see the most negative effects from the Bedroom Tax. People to miss the upcoming policy change are to be students, where less than 2% live in council housing. 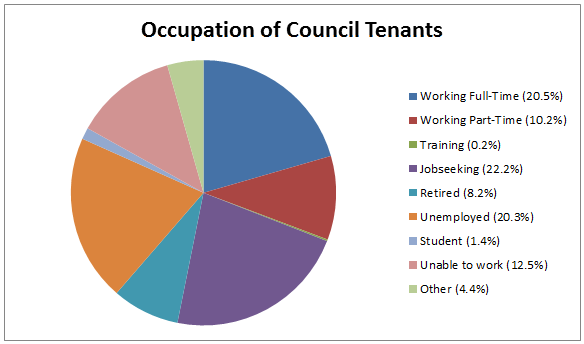 Only 0.2% of council tenants are in training, so this group of tenants are also likely to not be affected. Younger women than men to be affected by Bedroom Tax? Statistics released by the Government indicate that almost twice as many 16 to 24 year old females, than males, are likely to be affected by the Bedroom Tax. 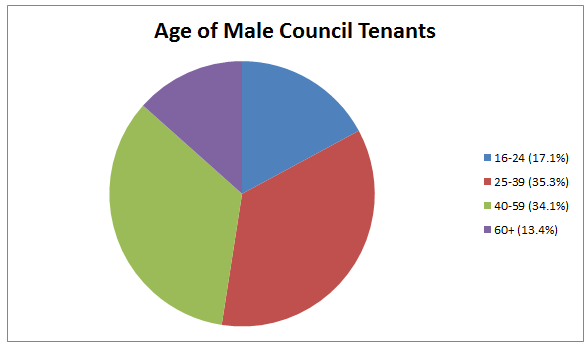 17% of male council tenants in the UK are aged 16 to 24, in comparison to nearly a third of females. 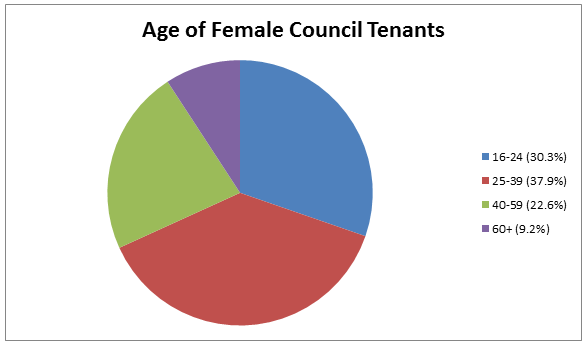 This data from 2011/2012 suggests that young women are likely to be highly affected by the Bedroom Tax policy as of April 2013. It is possible that many more younger females than males live in Local Authority Housing, because of the recent issue of teenage pregnancy. The UK reportedly has the highest teenage pregnancy rate in Western Europe, with almost 3% of girls aged between 15 and 19 giving birth every year. Therefore, the Bedroom Tax may be forcing vulnerable mothers and innocent babies out of their homes this Spring. Around 265,000 people live in Local Authority Housing in the UK, with Birmingham having the largest Local Authority by population nationally. This strongly suggests that a large amount of council tenants will be affected by the Bedroom Tax in the region. The Bedroom Tax: A perfectly mad system?